If you are a decision maker at your business, you may wonder what are the benefits of commercial steam vapor cleaners. It is a valid question. Many people are confused on the topic, because of the term “steam cleaner” has been used for a variety of things. For example, the steam cleaner you can pick up at the local home good store is more like a rug shampooer. It injects water and cleaning solutions into carpets and rugs. The water may be heated, but steam cleaning is not what the machine is made for. Commercial steam cleaners are made with stronger components—many metal parts—including a reservoir that can withstand higher temperatures to bring water to a boiling temperature and then pressurize that steam to deliver it in a stream from the wand. This can be done to walls, counters, furniture, and more. Whereas residential steam cleaners are okay for cleaning carpets, commercial steam vapor cleaners are great for cleaning everything else. Instead of relying on cleaning chemicals, the commercial steam cleaners use steam to sanitize various different surfaces, effectively killing greater than 95% of germs and bacteria. This makes for an inexpensive cleaning method as business owners will have no need to purchase the expensive cleaning solutions that other forms of steam cleaners use. This will save more money and time as the commercial steam cleaner can reach into corners, behind equipment, and other areas rather than having employees move things and spend their time scrubbing walls. Instead, a jet of steam handles the cleaning for you. 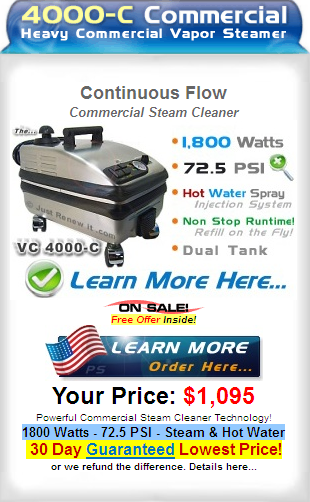 There is one option that makes a lot of difference when it comes to the different commercial steam cleaners available. Continuous fill steam cleaners can be hooked up to a water supply so that water is constantly being pumped through the unit. This means that larger areas can be sanitized without having to stop the machine, wait for the heat and pressure to die down, and then refill it. Most commercial steam cleaners are reservoir models, with a tank that is filled with water, heated and pressurized, and then can be used to sanitize an area. For many, the reservoir option works just fine. There are different sizes of reservoirs depending on how big of an area you plan for your sanitation projects. 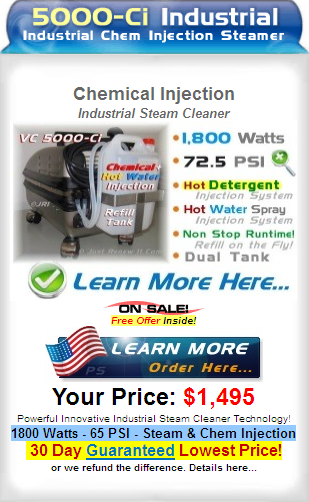 Some commercial steam vapor cleaners do have an option to make use of various cleaning chemicals. This can be helpful when dealing with areas that have heavy grease or oil built up. In some cases, standard household and commercial cleaners can be used. Be sure to check the manufacturer’s information for your particular commercial steam cleaner, though. There are certain cleaning chemicals that can eat away at seals and clog components within the unit. Using the wrong type of cleaning detergent can void the warranty. Following the manufacturer’s directions, however, and you can maximize the cleaning and sanitizing potential of the commercial steam cleaner without doing any harm to the unit. 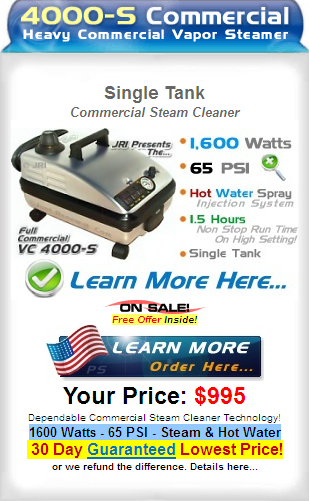 The commercial steam cleaner is sometimes referred to as a dry vapor steam cleaner. The reason for this is because the water is heated to such an extent that the steam produced is typically more than 95% steam. Because of this, you are not dumping a bunch of water onto your floors, walls, and other surfaces. They also use a lot less water. For the most part, if you were to run a commercial steam cleaner on its highest setting for an hour, the water use would be about a gallon or less. This is just another way you are conserving resources and therefore money when you invest in such a unit. Dry vapor steam cleaners, especially those made for commercial and commercial uses, clean deeper and more thoroughly than other cleaning methods. They kill a variety of germs, bacteria, fungi, and viruses. This can be especially helpful when in a high traffic area such as an office building or factory. Anyone who needs to concern themselves with staffing through a cold or flu season knows what kind of trouble biological contaminants can cause. By proactively addressing the potential for illness to spread in your business, you are protecting the health of your employees, customers, vendors, and other site visitors. The investment of effective sanitation in a business is most certainly worthwhile. If you can find a way to bring in something that is going to help you improve the productivity and efficiency of your office, you wouldn’t do it, wouldn’t you? If you can find a way to do it in the most cost effective manner, it becomes even more interesting to us. This is business, after all. Commercial vapor steam cleaners allow you to do just that. You can clean when your business is open without worrying about effecting someone’s allergies to harsh chemical cleaning agents. You can do it with minimal mess, because steam is cutting through the dust, grime, and germs rather than splashing water everywhere and needing to go back and clean that up. With the proper attachments, you can reach areas without having to move everything out of the way and that can save a lot of time. The commercial steam cleaner allows you to enact an environmentally safe solution to sanitation within your business. The solution shows that your business is concerned about your team members and clients. This kind of goodwill from your brand can go a long way toward benefiting the overall profitability of your organization. Be4yond that, you are cutting costs in almost every way imaginable with a single, well planned investment. These are the same units being used in hospitals, government buildings, labs, food preparation facilities, hotels, and more. This shows that they are effective and one of the best solutions for any company to look into. Dry steam may be a relatively new technology to many people, but commercial steam vapor cleaners will soon be the norm.